Posted by Whew, the recipe title is a mouthful… and what a tasty mouthful! One night I had a bag of Brussel sprouts kicking around, a bit of cream cheese that needed to be used up before it expired, but I had also wanted to have fish to get some healthy omega 3's in. It was like a Food Network Chopped episode where I had 3 oddball ingredients: brussel sprouts, creme cheese and canned salmon. I love Brussel sprouts deep fried or roasted to bring out their sweetness.. then it clicked.. roast dem sprouts, make a salmon cream sauce, jazz it up with some white wine and toss it all together with some pasta (gluten free or rice pasta if you swing that way). Beauty. Nom! If you're feeling like fresh fish, grab a couple fillets, season with salt, pepper, a splash of wine, a squirt of lemon juice and gently sear a few min on each side in a frying pan. If you were feeling super lazy like me you can use just about any type of canned fish you happen to have on hand.. tuna, pink salmon, wild salmon… just don't toss in a can of cat food (cuz your cat will be pissed!) and you're ahead of the game ;D Next time I'll add or replace the salmon with crispy bacon and seared chicken breasts for a more indulgent dish and a pop of color… or just all bacon baby heehee!! :D I used a deep non-stick pan to make my life easy. -1 can of fish - tuna, salmon, whatever you like (small can if you want just a taste, a large can if you want a bigger hit of protein. 1) Preheat oven to 400F. In a large mixing bowl, toss the Brussels sprouts with 2 tablespoons oil, 1/4 teaspoon salt and 1/4 teaspoon pepper, dump into a large non-stick cookie pan or baking pan. Bake, uncovered, at 400° for 25-35 minutes or until tender in the centre when you poke it with a fork. Smaller Brussel sprouts mean less roasting time, larger ones need the longer cooking time. 2) While the sprouts roast, cook the pasta according to package directions; drain, and set pasta aside. 3) In a small frying pan, sauté sweet onion, the white parts of the green onion, garlic, butter and 1 Tablespoon oil on medium heat until onions are all nice and translucent (about 5-7 min). Stir in wine and 1/2 cup chicken broth. Bring to a boil and cook until liquid is reduced by half. 4) Stir in the cream cheese, then stir in the canned fish, making sure to smash up any of the soft bones present. 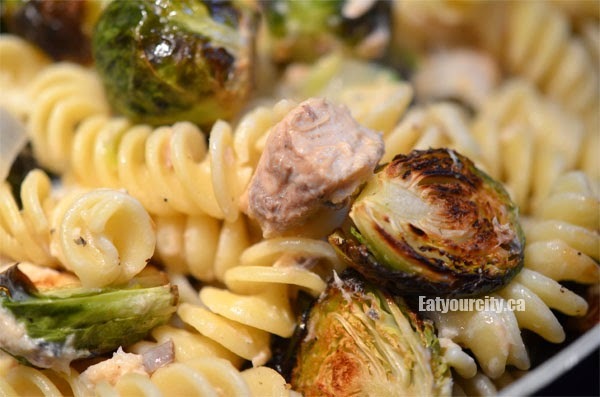 Turn off heat, stir in the green parts of the green onion, pasta and roasted Brussel sprouts. Salt and pepper to taste, top with freshly grated Parmesan cheese or asiago cheese if you like.